Cor Curiad ladies choir from Llanelli have just celebrated its 20th Anniversary with a year of fund raising for Calon+ charity which supports the work of the Carmarthenshire Cardiac Rehabilitation department at both Glangwili Hospital Carmarthen and Prince Philip Hospital in Llanelli. 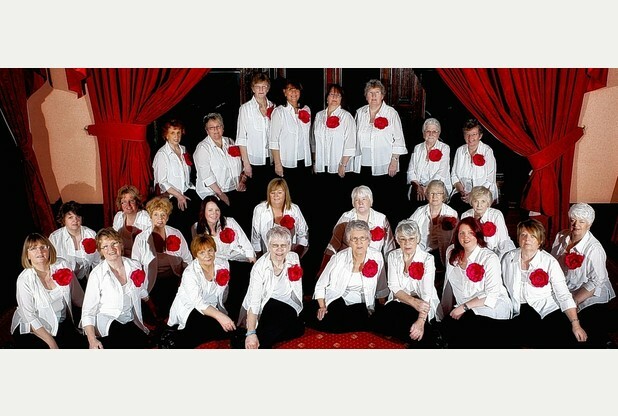 The choir consists of 40 members including a set of twins, sisters and 4 mother and daughters, their age spans from 14 to 84 they have a very varied program of music from traditional welsh tunes to recent chart hits from Snow Patrol, Queen and Elton John. Their year of fund raising started with a family B.B.Q. followed by a Disney themed sponsored walk from Llanelli beach to Burry Port harbour. The ladies had some very funny looks from passers by when confronted with Snow White and her Dwarfs, Cruella De Vil, Jasmine, Cinderella, Bee and the Shrek family to name but a few. They held a Craft Fayre with Fashion Show and music from the Choir, Bus Trips, meal nights, and race night also bucket collections at Ffos Las racecourse, Tesco Ammanford, Tesco Llanelli and Marks and Spencer’s in Llanelli. The final event for the year was an amazing concert in Llanelli Selwyn Samuel Centre with world renowned singing star Paul Potts. The Ladies were recently awarded the Llanelli Star award for “Going The Extra Mile” for charity when the newspaper realised that over the years the choir has raised in excess of £50,000 for charities large and small, local and nationwide.